Fusiliers advance upon the enemy, firing volley after volley before they close with fixed bayonets. Although they are foot soldiers, and lack the dash and elan of cavalry, they take a justifiable pride in their worth in battle. They can form square when threatened by cavalry, and give other enemy infantry a bloody time but they are still vulnerable to shelling by artillery and sniping by skirmishers. 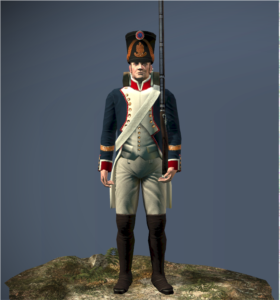 The fusiliers were considered the ordinary soldiers of Napoleon’s army. They enjoyed little of the prestige and privileges showered on the Emperor’s precious guards, his artillery formations, or the light troops. Yet they were vital to his victories: strong, dependable and loyal to Napoleon. They could be counted on to do his marshals’ bidding in almost every circumstance. This building allows basic military units to be recruited. A barracks allows a selection of military units to be recruited.